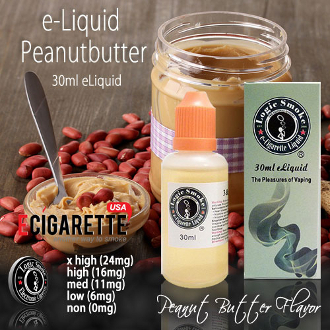 Our Peanut Butter e juice from Logic Smoke is so good you won't realize it isn't the real thing. The flavor of fresh ground peanut butter is packed into every inhale to satisfy your taste buds. It is wonderful vaped alone or you can kick it up a notch by adding our Blackberry E-liquid to it for a great PB&J taste. Pick up a bottle of Logic Smoke Peanut Butter e juice and reward your taste buds. The 30ml bottle is a convenient and economical size for purchasing in quantity. Fill your clearomizer or other e-liquid atomizing device directly from the bottle or use it to refill your smaller travel-size e juice bottles. You'll be ready and have liquid on-the-go at any time.